It has been said that all written communication is an argument, meaning whatever we write is intended to convince or convict those who read it. This could apply to all communication, everything created to present an artist’s vision. In my view, those who submit their ideas through words are artists just as are those who use diverse media. All are creating, bringing something unique to the world out of the well of themselves. If we are to argue, it is my opinion that we should do it through our own creation and not take someone else’s work to make our stand. This is not to say we should not own items created by others that we enjoy, but that when we want to engage in presentation and conversation that holds our opinions and beliefs, we should state them with originality. Granted one may study a subject and become well educated about an issue that their perspective is more enlightened and engaging, but the work is far more persuasive when stated by the individual owning the creation. Conversation among people becomes less appealing if one is always looking to Google on their phone for the basis of their talk. The same is true when discussing an issue in writing or artistic expression. We are the sum total of our lives and the lives of those who have influenced us. Our thoughts, feelings, opinions, ideas, creations, are worthy of presentation in the world. We should stand for ourselves. I am not discounting research, nor collaborating opinion, but when we present reasoning or refute a viewpoint, our thoughts and ideas should be the basis of our argument. What do you think? Are you more willing to engage with someone who speaks for themselves rather than using material gathered from wherever on the internet? I would love to know your insights on the issue. As a prompt, pick an issue you feel invested in and create a work arguing your side of the story. Thank you for visiting Haphazard Creative. There is a follow button should you wish to use it. In any case, I hope you will return. In all you do, believe, have, create, be you. Take care and be safe. Creative block is sometimes experienced, and at these times, often hard to overcome. It can postpone productive work for long periods. There are ways to avoid it. These may not be clear in the midst of the experience, but perhaps some preparation will assist. There are times when time is set aside for creation, and it gets postponed or interrupted by some of life’s happenings and emergencies. Other times procrastination sets in. These things arise inevitably. Such is the beginning of a habit that becomes ingrained. An hour is put off because of some urgent event, then a day, then a week, then months pass. This cycle must be stopped early. The voluntary action it begins with becomes a mental habit that is hard to defeat. Whenever there is an urge to work creatively, it should be heeded as soon as is possible to arrange. If some time has passed and avoidance is an entrenched mental habit the only way to break out is to face the blank page, canvas, surface, media and stay with it until work begins. This takes patience and dedication because there will be resistance. The mind, the hands, the body will try to escape, the impulse to leave and do something other will be overwhelming, but to become a functioning creative again there must be a beginning, a will to bring something new into the world. At this point, the output may not be desirable, but with renewed practice, expertise will return. It is the mind that creates the roadblocks after it is encouraged by poor time management and prioritization. Creative time must be guarded and planned just as appointments and events, though there should always be leeway for spontaneous creation. Sometimes it is a matter of not wanting to work because of discomfort with the product or simple resistance. When these problems present, getting busy despite the critical inner voice is necessary. Block can be overcome, it can be disarmed and sent packing, but it takes an act of will and determination to go on without compromise. Nothing great is ever created without putting in the time with the tools. It is unavoidable. Maybe this will help with the struggle. The monster is real, but it is usually of the creative’s making. What is in mind cannot be realized without hours of dedication to working. As a prompt, look around the current environment and select an item, tell its story, either in truth or make up a tale. If an artist, tell the story in some medium. Thank you for visiting Haphazard Creative. There is a follow button, or come back often. I know a bit about the beast under discussion. Should there be questions or thoughts, please leave a comment or fill out the contact form. Take care and be safe. We hold tight, never give up. And carry us through despair. We will, in time, rise again. Of all beauty which survives. Love, love; we never give up. But some never have a choice. Will advise, avoid it at night. Where such life was meant to be. It and allows no escape. Even Hades shuns these lost. Sometimes imagery is the way to deal with unspeakable things. I have used it here in illustration. If you have something to say that seems too hard, you might try this method. I had an excellent entry on Friday, but the business of life took over, and I never completed it. Perhaps after daylight. Thank you for visiting Haphazard Creative. If you would like, follow the website by clicking the button. I hope you will come again and that you will share the address with your friends. Take care and be safe. This is a bit of Photoshop work with a photo of mine and lines made up today. Creating memes is something I would like, but none I have done has taken off yet. Maybe you have a photograph and a perfect line. You could work those together and see what comes of it. As a prompt write a few lines, poem, or story about seasons changing. Time passes fleetingly, and this is a way to put it in perspective. Thank you for taking time to visit Haphazard Creative. If you wish you may use the button to follow the blog. I hope you will come back soon. Embrace your creativity and make it an everyday part of life. Take care and be safe. Most of us have done acrostic puzzles, but some may not realize it is also a poetic form. Often it is used to write about a person, event, or thing. The letters are written vertically down the page, each becoming the first letter of the respective line. Often the letters are capitalized at the beginning of each line. The lines are written out to create a poem. The line: Do art now, will be the starter of this example. Original thought to lead you? Are you stumbling in creative darkness? That is unlimited by time or space. With results, some might never imagine. This could be continued, but an acrostic typically ends when one runs out of letters. Name acrostics are often done for special occasions, like birthdays, weddings, anniversaries, promotions, and to celebrate relationships. Give it a try. The form is actually rather simple to complete. The lines do not have to have enjambment, which is where one continues into the next, some might stand alone. Thank you for visiting Haphazard Creative. There is a follow button which may be used to ensure posts are never missed, or there is the option of returning often. May inspiration and encouragement abound in all life’s moments. Stay safe and take care. Art can be anything. 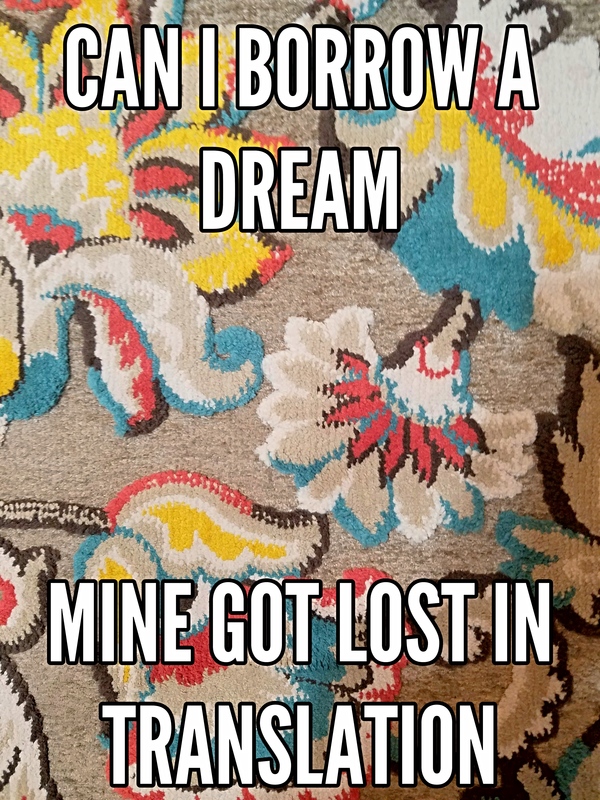 The pattern for the meme is a kitchen rug. If you look carefully at your surroundings, you will find the opportunity for creativity in perhaps, mundane things. There is so much beauty in the world that we often overlook. We live for something to overwhelm us when there is much in our lives that when looked at with open eyes reveals its unique character. Look around, see if there is something which can be incorporated into an interesting and arresting creation. Each of us is capable of making something out of almost nothing. The fabric of the universe, of our day, is ours to explore and use in myriad ways to further our creative impulse. Thank you for visiting Haphazard Creative, click the follow button, or should you rather not, please just come back soon. Stay safe and take care.